Last week, we posted our team's favorite snacks, with a focus on foods that are healthy and nourishing. Lauryn, our new Social Media Coordinator (she's the one you'll talk to if you message us on Facebook), loves popcorn. In fact, she calls it one of her all-time favorite snacks. And popcorn can be a really healthy snack. It all depends on which kind you use and what you put on top of it. We recommend buying organic kernels and topping it with healing spices like turmeric and healthy fats like coconut oil. This recipe also includes nutritional yeast, which is a food almost every vegan eater has in their pantry. That's because it's a uniquely non-animal source of B12, a really important nutrient that helps keep our nerves and blood healthy. You can find nutritional yeast in your local health food store or food coop (we love buying it in bulk). It's light sensitive, so make sure to store it in a cool, dry place. Pop popcorn on the stovetop. Melt ghee and coconut oil together and pour over popcorn. Sprinkle on nutritional yeast. This is really to taste, so if you want to add more than 3 tbsp, go for it! Add remaining ingredients, using your eyes and tastebuds as guides. 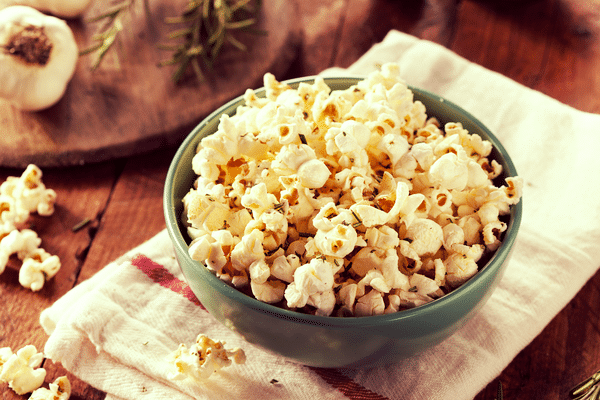 What do you like to put on your homemade popcorn? Let us know in the comments below! I love the taste of furikake. It comes in an easy shaker container with great spices added to the seaweed. It is a great way to enjoy the benefits seaweed offers. I also shake it on salads and steamed vegetables. Sounds like a great popcorn recipe. Glad you stated organic popcorn! My recipe is more simple. Add 4 drops of doTERRA Rosemary oil into coconut oil. (make sure it’s doTERRA, as it is safe to ingest). Pour coconut oil over popcorn, salt with good quality salt (Himalayan), toss and enjoy! Kelp is great on popcorn and my latest discovery……..white truffle oil and shitake mushroom powder…..
Popping on the stove is tricky. You need some oil and to avoid burning, you need to shake the pot (with a lid!) back and forth. A hot air popper is much easier and requires no oil. Nowadays, mostly just ghee and sea salt. Sometimes coconut oil. This sounds very interesting. Thanks for sharing! My favorite way to prepare popcorn is simply air popped popcorn, with flaxseed oil and Sea salt. It’s so good for you and delish!